Personally, I think that one of the biggest adjustments to adult life is learning to feed yourself because you have to eat, three times a day (give or take), everyday. Since this eating process has obviously continued in Hong Kong, I wanted to highlight some of the adventures that I have experienced in the culinary world here. 1. My kitchen contains no oven, one burner and a tiny sink (see previous post for pictures), so making a meal involves a skillet or a pot. Adaptation strategy: I make rice towards the beginning of the week so that I can just heat it up. If I have a craving for something baked, I go over to my friends’ apartment to use her oven. 2. I live in walking distance from four grocery stores and a fruit and vegetable market. However, they all sell separate things. The international grocery store has things like granola and real milk but is very expensive. The Wellcome (spelled correctly) has better produce than the Park N’ Shop, but does not sell cheese. The Park N’Shop sells a decent variety of dairy products but not garlic or potatoes. 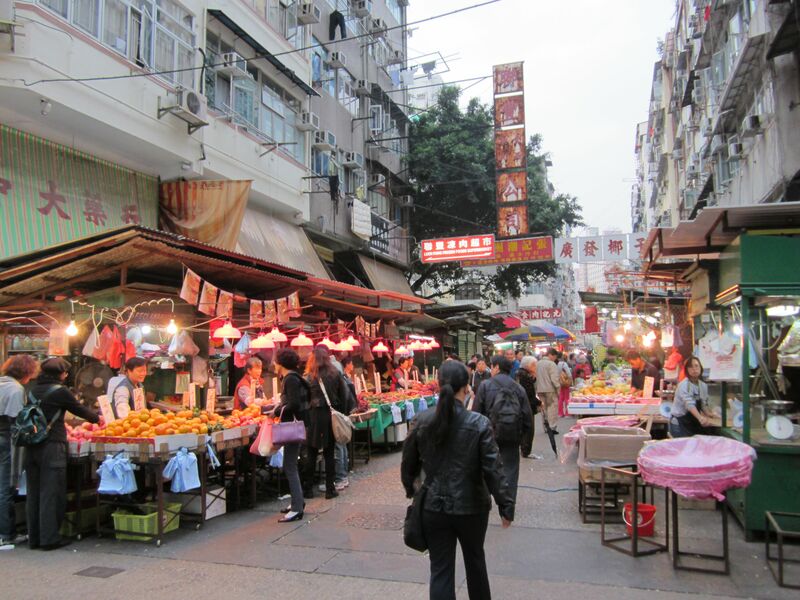 The fruit and vegetable market has great, fresh produce, but you can never predict what will be there, if you can find a specific item in the crowd and of course, everything happens in Cantonese. Adaptation strategy: Buy something that I have no idea what it is once a month. Learn to decipher the roman numbers amidst the Chinese and therefore how much stuff costs. Accept that I will probably go to the grocery store three times a week. 3. Since I live on a budget, sometimes I have to purchase things that I normally wouldn’t because it’s the cheaper option. For instance, around Thanksgiving, I decided to roast a chicken. (Turkey is incredibly expensive) The cheapest chicken had the head and feet stilled attached but I got it anyway thinking “I’m a grown woman, I can surely cut off the head and feet”……Beth, the other Mission Intern, had to cut off the head and feet for me because I was weirded out. Adaption strategy: Just go with it and have faith that it won’t be that bad. I finally have a system and manage to cook dinner a few times a week. This week, I made beans and rice from dried beans, and sauteed cauliflower with chickpeas. Also, I never pass up a free meal! January 25, 2013 in City life.